Is Your Car Melting In Your Garage? Automotive jargon making you feel out of the loop when you take your car in for service? If so, you’re not alone. Sometimes mechanics forget their customers might not know as much about cars as they do. 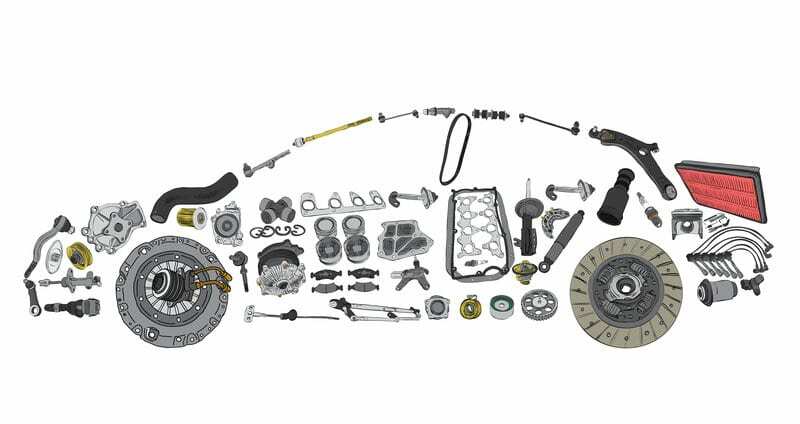 While the mechanics at Scott’s Fort Collins Auto & Repair strive to communicate without leaving you behind, it’s helpful to become familiar with common car terminology so you know the function of major auto parts. Carburetor: A device that mixes gas and air before being fed to the engine. Fuel injectors: Little nozzles that squirt gas into the combustion chambers. Fuel pump: A pump that draws gas from the fuel tank to either the carburetor or fuel injectors. Coolant: A water/antifreeze mix that keeps the engine from overheating. You should keep a spare bottle of premixed coolant in your car in case of an emergency. Thermostat: A “gate” that remains shut until the coolant reaches a certain temperature. Then the gate opens and lets the coolant pass. This function allows the engine to warm more quickly upon startup. Axle: A metal shaft attached to each wheel. Driveshaft: A spinning metal shaft responsible for transmitting power from the transmission to the wheels by turning each axle. Cylinder: One of multiple bores in the engine block that houses a piston. This pumps up and down within the cylinder to produce power. Intake manifold: A set of pipes that carries the fuel/air mixture to the cylinders. Cylinder head: The entire top half of the engine that sits on top of the engine block. Camshaft: A metal shaft in the cylinder head that opens and closes the valves. Crankshaft: The backbone of the engine, which is acted upon by all individual pistons. Timing belt: A rubber or fabric belt linking the camshaft and crankshaft. It’s responsible for ensuring the valves open and close at the proper time for efficient ignition. If neglected, the timing belt can break and damage the engine. Disc brakes: A braking system where brake pads are squeezed against a disc. Most modern cars have this type of braking system. Brake calipers: Metal devices on disc brakes that you can see through the wheel. They house the brake pads and squeeze the pads onto the discs in disc braking systems. Drum brakes: A braking system where brake shoes are pressed against brake drums. Older cars have this type of braking system. Brake drums: Metal drums mounted on each wheel in drum braking systems. Brake shoes: Curved pieces of metal found in drum braking systems with a high-friction material called brake lining attached to them. When pressed against the inside surface of the brake drums, the vehicle stops. Brake cylinder: A small cylinder found in drum braking systems that forces the brake shoes against the brake drums to stop the vehicle. Bleeding the brakes: A process of pushing air bubbles out of the brake fluid to ensure the brakes continue working properly. ABS: Anti-lock braking system. This keeps the wheels from locking up so the driver maintains steering capabilities during full-force stops. CV joints: Flexible couplings between two CV shafts that allow each to keep the same driving speed regardless of angle. Shocks: One major component of a vehicle’s suspension system. They act as springs to cushion the ride over bumps. Shocks must be replaced periodically because they wear down. Catalytic converter: A chemical air filter in the exhaust system, which can “go bad” if the air-fuel mixture goes awry. If this happens, the catalytic converter acts like a cork in the exhaust. At Scott’s Fort Collins Auto & Repair, we won’t talk over your head when you come in for a car repair or maintenance. We make sure you understand the problem, whether it’s important to fix, and what the price will be before we begin so there are no surprises. Call us at (970) 682-4202 to schedule an appointment! Buying Cars Online: Safe or No? How Important Is Your Car Engine? Automotive Service Specials - For all your care care needs from tires to auto repair! What Is a Natural Gas Vehicle? Car Fixes: Are You Getting a Good Deal? to have been guided to Scott's Auto Service in Loveland. auto service to care for our truck. We recommend Scott's Auto Service of Loveland, to help with many services in the maintaining of your vehicle. Thank you for all your help,kindness, encouragement.